What a whirl wind week we have had with Madri Gras and Valentine celebrations all in the same week, it was awesome and we had so much fun. Now it will be nice to just get back into a normal routine for a while. I sure am glad to see you today and I have made some wonderful Baked Apple Oatmeal Muffins for you this morning from my friend Danielle at Mostly Food and Crafts, come on in and we will sit by the fire and enjoy our muffins while we check out The Menu for next week. It was really good to spend time with you today, hope you have a great week and come back to see us real soon! Your soups and casserole photos looks great! I need some of that vegetable soup now. Thanks for the pin, I appreciated very much ;-). 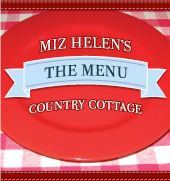 Sounds like a great menu at your cottage this week, Miz Helen. I'm still enjoying comfort foods since fall and winter is my favorite time for cooking. Now, I'm off to watch Downton Abbey! It certainly was a busy week with two holidays. Next month will be pretty busy to, what with St Patty's day and Easter being only two weeks apart.